I was never a true contour fan initially. 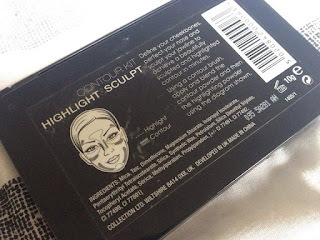 After testing out the Maybelline contour kit the craze never really stuck with me. To this day I tend to just apply a bit of bronzer on my cheekbones and around my face to give it a bit of definition. But I wanted to start seeing what I could really do if I did contouring properly. 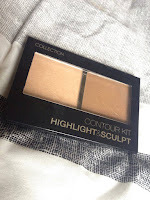 I picked up the Collection Highlight and Sculpt contour palette. First off this kit gives you two massive amounts of highlight and contour powder in the packaging. It has a little mirror included at the top which I personally don't really see any use for as the mirror is so thin and tiny you can barely see your face through it. From looking at the kit I can already see how shimmery the highlight it. 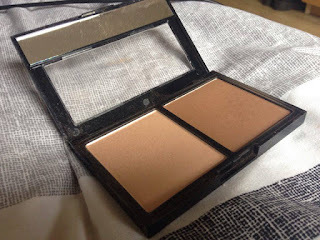 The pigmentation of this is beautiful, blending in smoothly almost like a dream highlighter. Until you've worn this product for a few hours. Now I don't know what happens to it. I have tried this with different bases and it does the same thing, after a few hours of it being all light and shiny it goes to this muddy silver mess. It looks like I've just fell in a pot of uneven glitter. Even after using a setting spray it still does it. So for highlight I will probably just stick with my Sleek Solstice Palette Now for the contour powder, this is the gem of the two. It probably isn't the best contour powder out there but it has been a very good starter one for me. This is a highly pigmented powder that is quite dark but not so dark for my skin that I'm having to blend it into the heavens. I tend to just blend a little bit of this onto my cheekbones, around the top of my face and on the jaw line. Making sure it is all blended so that I don't have any brown lines later on. does tend to fade away. But you are still left with a strong defined face. 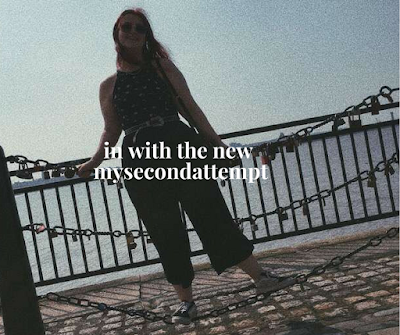 This kit was priced at £4.19 and honestly I would say that for the fact that I just didn't get on with the highlighter at all the price annoys me a little. But as a starter kit I think this is fairly reasonable and in terms of the good contour shade it's good to use for beginning to contouring or even if you already can. The key is to really blend it in and make sure you are contouring the right features at the correct angles. But overall I really do like this kit and I'm excited to hopefully carry on using it until I run out.